Affordable Accoutrements: Another Room, Another Collection! Happy July 4th! Thank you for all the thoughtful, caring comments on my first attempt at participating in a “Tablescape Thursday,” hosted, as you all know, by Susan at Between Naps on the Porch. The solarium is where I photographed the mojito cocktail I mixed for you a few days ago. Do you mind if I call it the solarium? It just sounds more interesting (and fancier, more pretentious) than sunroom … or sun porch, doesn’t it? The "tablecloth" below is a shower curtain from Goodwill. It was priced at $2.99, but it was half price that day. Dinner guests always comment on how much they like it -- I just smile and say thanks! It’s called Libbey/Rock Sharpe because it uses Libbey Glass Company's blank (Stem # 3005) which Cataract-Sharpe Company used for their Rock Sharpe line. Cataract-Sharpe Company purchased blanks from Libbey for their fine cuttings. This stem was made during the 1930s - 1940s and has Libbey's chip-resistant "Safedge" feature introduced in 1924. Bryce Brothers Crystal and A. H. Heisey were other big suppliers of crystal for Cataract Sharpe in the 30's and 40's. The company made no glass itself. 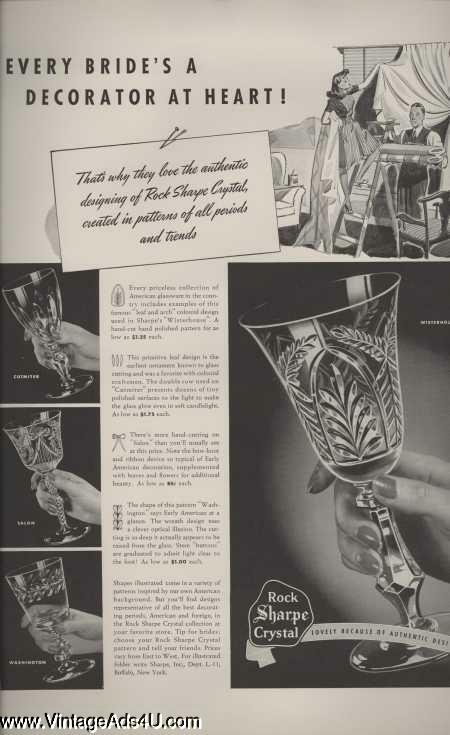 In the 30's and 40's, the company widely promoted its Rock Sharpe Crystal products in major women's magazines. 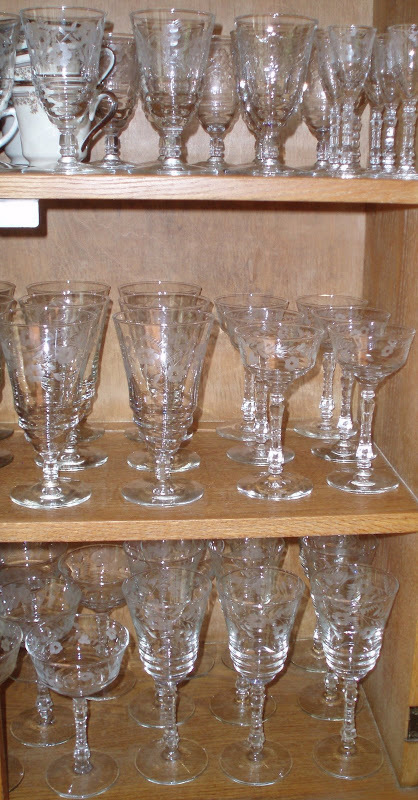 Rock Sharpe was sold in fine department stores and was some of the best-selling stemware in America. I get compliments on the glasses every time I use them to serve guests. If you like them, and find some the next time you go shopping, buy them for me and I’ll reimburse you. Wait --- I didn’t mean to say that!!! I meant that perhaps you can start a Rock Sharpe collection of your very own. Bye for now. Hope you all have a wonderful July 4th! Hi, I found your blog from Rhoda's and Susan's BNOTP. You have a fantastic solarium! What a great space to entertain, and just those glimpses of your Rock Sharpe look impressive! My nephew is Cuban and makes the best Mojito's. I'm off to check out your other posts. Happy 4th! Bill-You DO collect stemware! These are so lovely and different. Thanks for the background and that magazine ad!!! I love to see the old ads--not too politically correct, but very interesting. Your solarium looks like a great place to spend quiet time or have a party! Happy 4th! Bill, what a wonderful room you have.. I can see many a happy hour spent out there sipping a cool refreshing drink out of your Rock Sharpe stemware. They are simply gorgeous!!! Thanks for the history as well. Happy Fourth.. 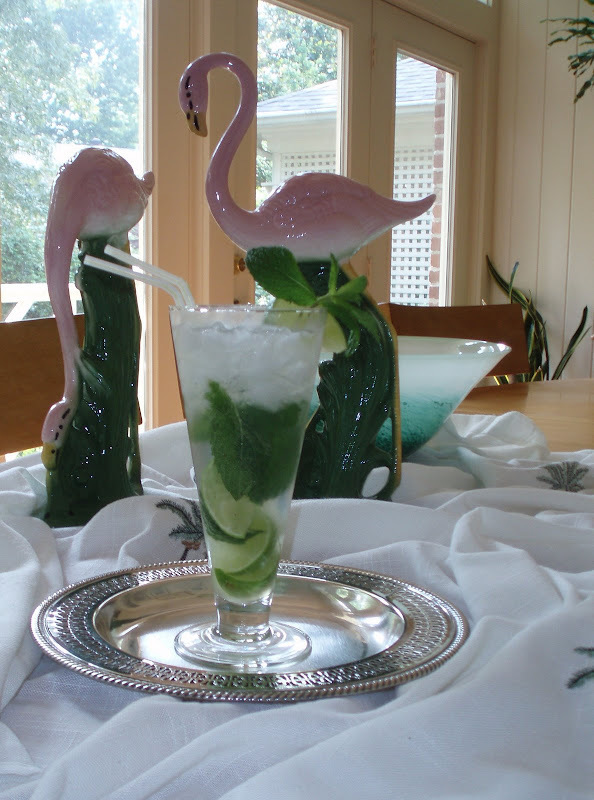 I just LOVE your collection, and those flamingo figurines... the Florida girl in me jumped for joy! LOL! I love your glasses! I'm lucky to have some from my husband's family and I do enjoy it - I'm finding more ways to use them - Lovely collection! Gorgeous stemware. Now I want the flamingoes AND the shower curtain. You evil man. However, I can just enjoy the pretty tablescape. Cat peeing on furniture. Wow. I'm checking with some friends and I can let you know...we did have a cat that peed in our youngest daughter's bed, but we'd only had her a short time. We had gotten her from a co-worker and that was sort of the last straw with her...very weird cat and that was it for hubby's patience with her. So she left our home. We have had a problem or two with spraying, but that stopped when the male was neutered. The Siamese was very considerate. The only thing he sprayed was the washing machine and that was easily cleaned and descented. I'll do some checking and see what I can find out. Lord, I should NOT have shown the flamingos to my oldest daughter and hubby. Wretched child and husband. Bill: I just found your blog and I LOVE it! I have just surfed around and absorbed every little bit! I love estate, tag and yard sales too! I love the stemware! Gorgeous! I am not too far from you as I live in Alabama!